Once you have chosen your plan and lot for your new home, construction will begin. Generally the building process will take between four and seven months to complete, depending on the product type, size, and finish of your home. Communication is essential to any successful relationship and is a crucial part of success in everything we do. We are committed to timely and effective communication with you, our employees, and our contractors. We have established systems that allow communication to flow efficiently throughout our business. Regular and meaningful communication keeps us in control and keeps you informed. We will guide you through the entire building process and establish a schedule of regular meetings between you and MHG. Site work and Foundation – Before any dirt is moved on your lot, behind the scenes work will be completed, including obtaining various permits and finalizing the building plans. The next step in the process is the site work and grading as we prepare your lot for the foundation and take measures to control erosion. Next, foundation forms are set and the concrete is poured for footings, poured walls, and the house floor. Although it varies for each project, this typically takes several weeks. Framing and Roofing – The walls and structure of your home take shape as the framing stage is completed. 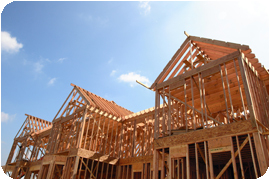 The skeleton of your house is constructed and the roofing materials and flashing are installed. During this stage, the exterior windows are also installed. If the house is pre-sale, it is at this stage of construction when you may walk the house and determine where electrical and cable outlets will be installed. Mechanicals – The mechanical stage refers to the installation of the heating and air conditioning units, duct work, electrical wiring, low voltage wiring, and plumbing. During this stage, many of the initial county and/or municipal inspections occur. Exterior Finishes, Insulation, and Sheetrock – Exterior coverings are installed and may include brick, stone, shakes, stucco, siding, or any combination. The home’s insulation and sheetrock is installed next. This is when your home begins to resemble its final form and shape. Trim, Painting and Interior Finishes – Depending on the stage of your home at the time of contract, you might have the opportunity to meet with MHG professionals and design consultants and make your interior selections. During this stage, the interior trim and cabinets are installed, countertops are set in place, and the interior and exterior of your home are primed and painted. New Homeowner Orientation – Upon the completion of your home, and usually a couple of weeks before closing on your home, you and a MHG professional will tour your new home. During this time, a final list of items that need to be corrected prior to closing will be agreed upon. We will also discuss various features of your new home, the mechanical systems, and share important home maintenance information. Final Homeowner Review – A couple of days prior to closing on your home, you and a MHG professional will re-walk your home to review and sign off on the items that were identified and corrected from your new home orientation walk. 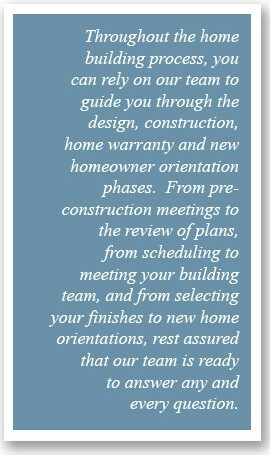 For a listing of frequently asked questions regarding the building process, refer our Common Questions. For a listing of common building and construction terms, refer to Building Terms.